2007, 401 pages. Genre : Crime Comedy. 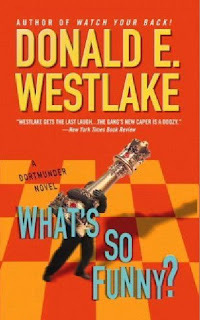 This is the latest (#13) in Westlake's Dortmunder series. John Dortmunder is a lovable galoot of a burglar, who here is blackmailed by a retired detective into masterminding a heist of a jeweled chess set, originally earmarked for the Czar of Russia. WSF? is a fast and fun read. Dortmunder and his associates are slow-witted but persistent, true-blue to each other, and lovable New Yorkers through-and-through. They are all proficient at their purloining profession, and take great pains to plot each caper carefully. But their best-laid plans inevitably go awry. According to Wiki, the books are formulaic. The heists are always ethically-justified (the chess set here was already stolen property); meticulous plans are laid; things always go wrong; the gang is nevertheless muddly successful; yet in the end the goods somehow elude their grasp, ending up in some noble and charitable person's unwitting possession. Oh, and no one ever gets killed. I'd probably go batty if I had to read all 13 of these, but since this is only my 2nd Dortmunder book, the "formula" is still interesting. Less interesting is the first third of this book. The ex-cop forces Dortmunder to take the job by means of an incriminating photo of him at an earlier burglary scene. Okay, that's a plot device, and I can accept that. But the chess set is in a heavily-guarded vault, and for the first 150 pages, all Dortmunder does is sit, think, meditate, and conclude that a break-in is impossible. It would've been a better pace to spend the first 125 pages detailing the circumstances of Dortmunder getting caught on camera, allow 25 pages for "It can't be done", then move into the "Oh, things have changed. Here's how we're going to do it" stage. We'll call What's So Funny? cotton-candy for the mind. There's nothing heavy or substantive here; it's all-too-soon done and gone; yet in the end you're happy for having partaken of it. It's a good choice for when all you want is some "Lit Lite". I think it's interesting that the heists are always ethically justified. Usually ethics are not a primary concern in crime books, particularly nowadays. My son was reading, not crime books, but a fantasy series that he started to tell us about and we realized it was a big glorification of thieves, gangs, and so on, so we ended his involvement with it. I don't like TV, movies, or books that make lawbreaking behavior seem glamorous in any way. Lawrence Block is another author in the same genre. his Bernie Rhodenbarr series features a burglar who also happens to solve murders. everyone Bernie steals from is a snotty, unlikeable sort. the suggestion is that these people deserve to be robbed.